​Liverpool Tree Surgeons Services are ​Land and Brush Clearing Specialists. ​Click here to call our Liverpool Tree Surgeons. Land and Brush clearing services are vital to keeping your land looking the way you want. Liverpool Tree Service can handle clearing your land, no matter how large or small the clearing job is. We can manage both businesses and residential areas. What should you expect from Liverpool Tree Service? 1. Special Equipment. Our professional tree surgeons use specialised equipment that is specially designed to help clear land without significantly affecting the environment. We also have a technical machine that’s designed to make mulch from the branches and brush we take out from your property, so you can use it to enrich your soil. 2. Physical Work. Clearing bushes is a very physical task and should be handled by professionals for this very reason. This manual labour can be very intense at times. Quite often it’s more than just brush that needs to be removed. Such things as appliances, and other items, that may have sat on the land for extended periods of time. 3. Construction clearing. If you have a construction project ongoing, our local tree company can handle clearing your land and the whole area for these large projects. 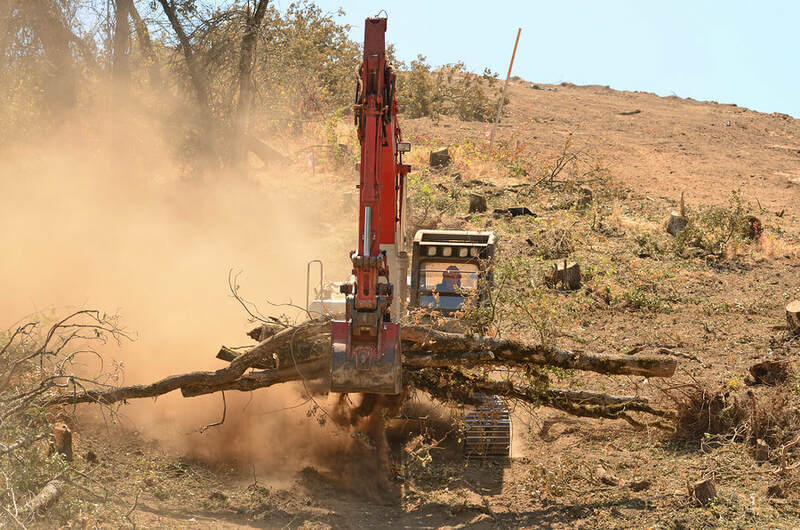 Clearing land for most construction purposes involves the use of various heavy duty pieces of equipment, the kind only a professional like us has and can use. 4. Safe and Thorough Land Clearing Services. We always keep all aspects of safety at the forefront of all of our jobs at hand, so we’ll handle yours with the utmost of care and respect. We will clear out your land safely, efficiently, and fairly quickly. 5. Junk Disposal. Often, when brush and bushes are needed to be cleared, there is also the need other debris to be removed as well. Typically, this has been hidden under the brush and can involve objects such as old electrical appliances or other debris that has been left behind after a remodel. Our tree care service will dispose of this junk and other debris on your behalf, properly, either by composting recycling, or correct disposal of hazardous waste. Our tree service company has been in this field for a long time, and we've been working hard to keep the Liverpool area clear of fly-tipping debris during the course of our working careers. We have a lot of references that are available to you if you request them. Give Liverpool Tree Service a call today on 0151 380 0007 for more info on our land and brush clearing services. Or, if you prefer, complete our form and one of our professionals will call you back as soon as they get your requested information together.